Five years ago, we published a series of interviews with women of the Forex trading world. We talked with 8 women with different backgrounds and profession and from different generations. But all passionately trading currencies. We wanted to know what they have been experiencing in the last 5 years: do they have the same job? Do they have the same opinions about men and women in Forex? How do they manage to balance private and professional lives? We have been in touch with all of them (Karen Jones, Jody Samuels, Carol Harmer, Triffany Hammond, Valeria Bednarik, Kathy Lien, Jane Foley and Raghee Horner) and they happily agreed to give us un update about their life. We will be publishing their interviews in the coming days and weeks. Some made radical changes, you will see! A study about the state of the Retail Foreign Exchange Market released by Citi in January 2014 reports that in Europe more than 40% of retail traders are women! 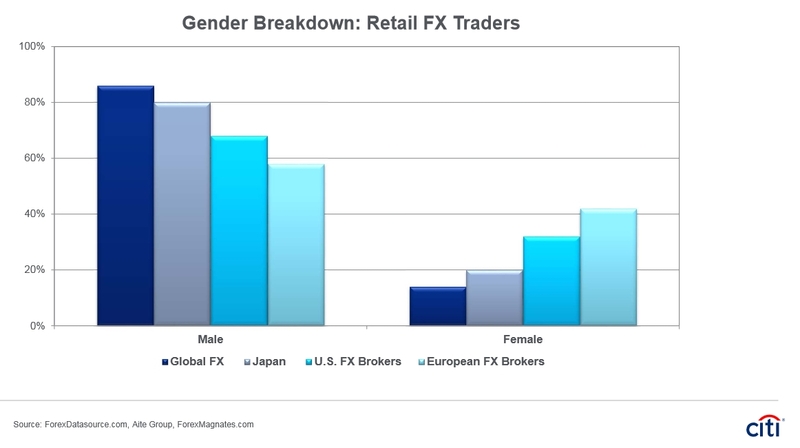 More recently, in April, City Index published an infography called ” The rise of the female trader”. Numbers speak for themselves: “46% more women opened accounts in January to March 2015 than in January to March 2014. On Average, women are responsible for 8% of the total trades placed each month.” Among the markets they trade, 80% of women trade Indices then come currencies with 10%. Not only are there more women behind trading platforms, they are also gaining ground in the media. Some of them certainly saw an opportunity in this rising niche of female traders. In celebration of the International Women’s Day 2015, Forex broker Orbex launched the “#InvestLikeHer” campaign aims at raising awareness of successful women in finance and at telling their stories of success.